God provided me an amazing opportunity to have over 20 minutes of undivided attention with a Christian neurologist whose career focus is researching Parkinson’s Disease. 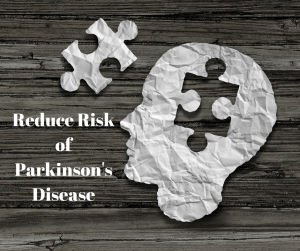 What are the risks associated with developing Parkinson’s Disease? There are several reasons why this was such a great opportunity, however, the biggest reason is my personal family history of Parkinson’s – which ultimately took my grandmother’s life and her mind; years before her death. Now that I am 60…6-0…Six-TEE, I’m starting to be more aware of the aging process and looking at how my parents and grandparents age. The Mayo Clinic lists AGE as the number one risk factor for Parkinson’s disease. Only 4% of all diagnoses are under the age of 50. While this is a risk factor, much research in the field of epi-gentics shows that you can reduce hereditary risk factors in any disease with diet and lifestyle improvements. Extensive studies of thousands of participants at a Swedish university revealed those suffering from depression were 50% more likely to develop Parkinson’s disease. I have to admit, the past two years I have not been as resolute in my wellness plans. Grief, family loss and personal stress have filled my mind, putting a barrier between what I know I should do and ultimately doing it. I know my grandmother experienced two traumatic events in the few years preceding her symptoms and she battled depression because of these two events. See the article “Digging Deeper Into Parkinson’s Disease” for more info on this. Men are twice as likely to be diagnosed with Parkinson’s Disease. I’ve been praying for several weeks about getting myself back on track, asking God to jump start me. I truly believe this chance conversation with an extremely well-educated man was God’s way of jump starting me back to living WELL all the time. My conversation with this gentleman and his current findings and beliefs about Parkinson’s Disease led me to seek out answers to my questions on how to reduce risk of Parkinson’s Disease…questions we didn’t have time to address. The main gist of his research is this; there is a huge gut-brain connection in Parkinson’s Disease. Current research is trying to determine if constipation is a predetermining factor leading up to Parkinson’s Disease and nutrient absorption plays into overall brain function. My conversation with this neurologist/researcher and my own background in what reverses other chronic diseases led me to these 6 steps. I’m not saying they will heal or reverse or prevent Parkinson’s Disease. I AM saying these 6 steps may give me and anyone with genetic predisposal a fighting chance at avoiding the development of Parkinson’s Disease and will definitely improve the quality of life for those currently struggling with Parkinson’s Disease. My personal theory about reversing any chronic health condition is Stress Resolution. The Stress Triangle shows the 3 forms of stress we encounter, emotional and spiritual, physical and nutritional stress. 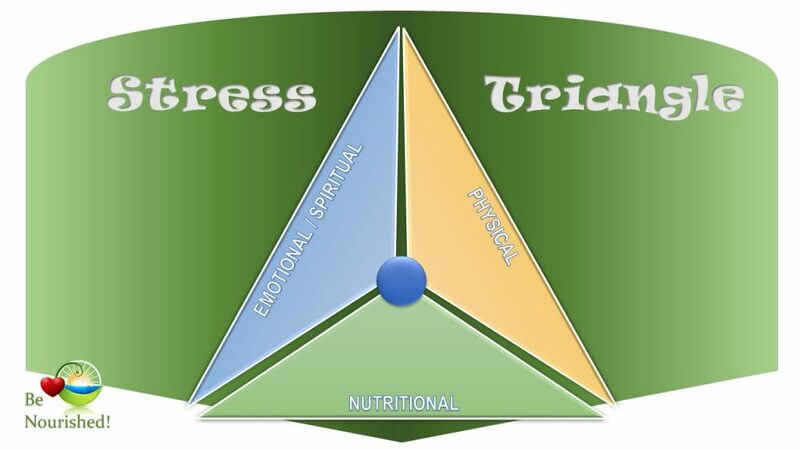 You notice the foundation of this Stress Triangle is nutrition. As a Christian, and I think many of you will agree, I once believed the foundation for a healthy life was addressing spiritual and emotional stress. However, since I became Wonderfully Well back in 2005, I’ve experienced and watched a huge transformation take place in my students when they address Nutritional Stress. Look around you. How many good and godly men and women do you know who are falling apart physically? They are connected to God in prayer and the Word, they are involved in a church fellowship, possibly they have gone and been anointed and prayed for to receive healing…but they are still sick. And they don’t nourish their bodies. It makes sense. Think about it; your body is the vehicle for everything you do. If you sing, you need your body. If you write, you need your body. If you walk, run, jump – you need your body. What is it that fuels your body? Food. Good, God-Made Food. So, if you resolve nutritional stress caused by eating processed foods, sugar and foods that offend your body, you’ve also impacted your mind and emotions and physical stresses such as low energy, weakness, and pain. I like to think of it like this…if you hit your thumb with a hammer, hard, you can cause some major damage. So you could go to the doctor and even be prayed for to receive healing. Cool. However, if you hit that same thumb with a hammer over and over again neither God nor the doctor can help your thumb heal. You are continually damaging it. This is what we do with processed foods, sugar, and excessive alcohol and caffeine. We are damaging our body on a daily basis. No doctor or prayer will heal something that you control with your fork and spoon. The findings this doctor/researcher shared with me screamed “resolve nutritional stress“and then work towards resolving remaining emotional and spiritual stress. I asked him about things like probiotics, the microbiome, bowel flora, neurotransmitters and nutritional therapy. He agreed these were all part of the picture but argued that results from these remedies were also highly variable among individuals and so could not pose a “cure”. My question…are results of these lifestyle and diet based remedies variable due to individual lifestyle and dietary habits or just are they plain variable – inspire of a beneficial diet and lifestyle? I really appreciated this gentleman’s kindness to dialogue with me and his answers spurred me to personal investigation. The following 6 lifestyle choices are based on my limited personal investigation into Parkinson’s Disease research and what I already know about living Wonderfully Well. The amazing thing is…these are basically the same 6 steps for reversing or reducing your risk of all disease. Stress Resolution – get to the root of negative stress and resolve it, rather than trying to manage it. Dictionary definition of Resolve: 1) settle or find a solution to (a problem, dispute, or contentious matter) 2)decide firmly on a course of action 3) firm determination to do something. Release Anxiety – tied to the next step, resolving constipation. Anxiety is binding to the body, soul and spirit and is usually related to a form of fear. Each blood type requires a certain type of stress relief that involves either movement, creativity, biblical meditation or a combination of these. The key word here is Release. Even getting a regular massage can help you release anxiety. You may also find certain foods, especially sugar, gluten caffeine and alcohol increase anxiety. Release those from your diet and see what happens. Resolve Constipation – eating more plant based foods, adding kefir or kombucha to your diet and making sure you get enough fiber and water will go a long way here. Our Be Nourished 4 Life program has a tutorial on how to make Kefir and Kefir cheese at home. It’s simple and delicious. Reduce Inflammation – sugar is the devil of inflammation. Just replacing refined sugar with natural sugars such as raw honey or stevia go a long way in reducing inflammation. Combine this with an anti-inflammatory diet and inflammation will be a thing of the past and reduce risk of parkinsons disease. Supplement Bowel Flora – dietary fiber and fermented foods are the doctor, good bowel function is absolutely necessary to reduce risk of parkinsons disease. Improve Nutrient Absorption – juicing is the best way to improve nutrient absorption. Our Be Nourished 4 Life program makes juicing easy. The amazing thing is this, Be Nourished 4 Life, a program God downloaded to me, provides all 6 steps to reduce risk of parkinsons disease. A significant boost to that program is our Intermittent Fast Boost which has powerful effects on the brain and anti-aging. You can find more information about the Be Nourished 4 Life Intermittent Fast Boost here. The Be Nourished 4 Life program teaches you how to create a sustainable healthy lifestyle using the Alkaline Plate and a quick and easy method of juicing. The Intermittent Fast Boost teaches you how to sky-rocket weight loss and cellular repair with a nutrient-dense intermittent fast, 5-6 days per month. Do you see any of these 6 steps you could incorporate into your life?